The Hindu holy scriptures: the simrithes, baedhs and puraans, pukaaran potheeaa - all of these holy scriptures of the world pukaaran - they proclaim one thing, what is that? Without the naam - the name of God everything is false. What do we mean when we say everything is false? 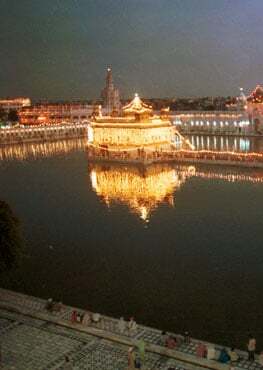 Everything is temporary, it will fall away, nothing is permanent without God and without Wahegurujee's name. Galee hosheeaa - all these words and all these things that we say are hosheeaa - they are all worthless without the name of Waheguru. All our cleverness and all our tricks and all these things that we think that we know this, we know that they are all false and they are all empty! Anything that is permanent that has any sustenance is God's name. The simrithes, the baedhas, puraanas and other scriptures of the world they have all proclaimed this. Simple by speaking is hosheeaa - is empty. The nidhaan - the treasure of God's name is appar - is limitless, where does it abide? In the man - the mind, the soul of the bhagathaa - of the devotees. The dukh - the pain of mohu - of attachment, of janam - of birth, of maran - of death nasai - it departs in the sangat - in the company of the saadhoos - of the holy Gurmukhs - those who meditate upon the Guru. Rehaao - Gurujee says pause and think about this today. Gurujee says, mohi baadh ahankaar - mohi - attachment, baadh - arguments, ahankaar - ego, if we spend our life in attachment, in arguments with other, in ego then sarapar runnia - then in the end we will be ruined and we will have to cry out. If we are vishunniaa - if we are separated from naam - the name of God then sukh n paaein imool - then we cannot even find an inch, an instant of happiness. The human being is bandhiaa - is tied down in the cage, in the imprisonment of maeree maeree - of ego. He is put through the cycle of rebirth again and again, going through hell, going through heaven, going through many life forms maaeiaa dhandhiaa - is entangled in the affairs of this world, this illusion, this maaeiaa. Gurujee says I have sodhath - I've looked inside me, I've looked in all the scriptures of the world. I've searched my heart, my mind and my body and thath beechaariaa - I've come to this essence, this one understanding, what is that? Without the name of God there is no sukh, there is no happiness. sarapar harriaa - everything else will fail, haariaa means to fail. Anaek - countless come on to this earth and jaahi - go. Mar mar janamathae - dying again and again and being born again. Bin boojhae - without understanding, without following the Guru's wisdom sabh vaadh - everything else is worthless. Jonee bharamathae - they are deluded and come in rebirth again and again. Those upon who Waheguru jee has become dhaeiaal - has become merciful thina saadhoo sang bhaeiaa - they've been blessed with the company of those saadhoo jan - those holy saadhoos - what does that mean? - Someone who has controlled their desires, those who meditate upon the Guru. You are blessed with their sangat, with their congregation, with their company when Waheguru jee is merciful. Anmrith - the immortal nectar of Waheguru jee's name, the essence of Waheguru jee's naam thinaee janee- those Gurmukh piaarey, those humble beings jap laeiaa - have meditated upon this in the company of the saints. Why? Because when we sit with the saints they say bol bhaae SatNaam Siri Waheguru - meditate upon Satnaam, meditate upon Waheguru - that is what the saints tell us to do. Visar naahee dhaathaar - O dhaathaar - O merciful Lord don't let me forget You. apanaa naam dhaehu - how can I remember You? Give me Your Name, give me Your meditation, give me Your Name that I may meditate upon it day and night. Day and night may I gavaa - may I sing Your gun - Your praises. Naanak chaao eaehu - this is the only plea, this is the only cry, this is only desire that I am putting in front of You.